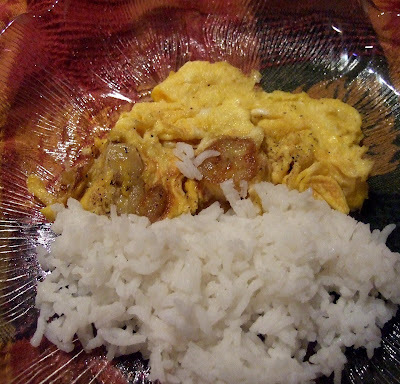 Something I loved to make around the time I was in college was a banana omelet with rice, or sometimes, banana fried rice with an omelet. I don’t know how I fell out of the habit, but you know, you get excited about new foods and they push some old staples out of the repertoire. I had just about completely forgotten banana omelets, but they popped back into my consciousness recently and I made them again just in time for Kanchana’s omelet edition of Weekend Breakfast Blogging. To make an omelet for one, I use one half of a Cavendish banana (a regular supermarket banana) but if they are available, one of those cute little lady finger bananas would be perfect for a single serving. Of course you can double the recipe for two. Every variety of rice goes well with banana omelets. This time I used basmati rice. You can emphasize the sweetness by using Thai black rice or other sweet rice, or you can use forbidden black rice for a sharper contrast. Short grain brown rice might be the most comforting and breakfasty choice. I also recommend banana sushi and tamago sushi, but I have never prepared them myself. Have some hot cooked rice ready. Heat about half a tablespoon of butter in a cast iron pan. Add the banana slices and sprinkle them with a pinch of salt, and cook. Beat two eggs until just combined with a pinch of salt and a teaspoon of water. When the bananas are deep golden on both sides, pour the eggs into the pan. Draw the edges inward as they cook. 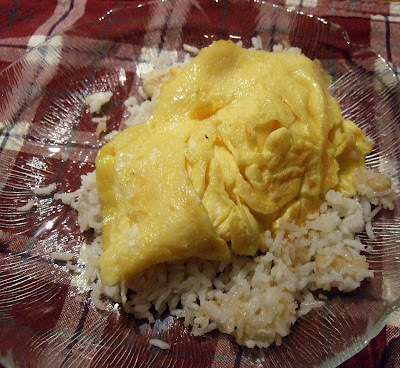 When the omelet is set, turn it out onto a warmed plate with rice. heat the first teaspoon of butter in a skillet. Add the banana slices and sprinkle them with a pinch of salt. Add the rice, and cook, stirring, until the bananas are deep golden on both sides and some of the rice has a few golden crunchy spots. Turn onto a warmed plate and keep warm while you prepare the eggs, or, if you are making more than one, keep the fried rice in the skillet and prepare the eggs in another pan. Heat the remaining teaspoon of butter in a skillet or omelet pan. Beat two eggs with a pinch of salt and a teaspoon of water until just combined. Pour the eggs into the hot pan. Draw the edges inward as they cook. 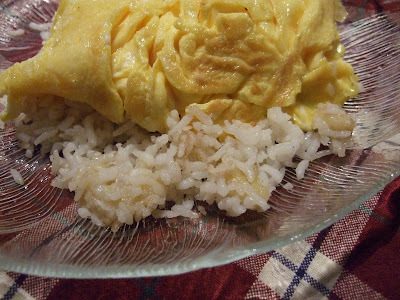 When the omelet is cooked, turn it out onto the banana fried rice. Be sure to see Kanchana’s WBB roundup at Married to a Desi, and of course, thanks to Saffron Trail for this event. I would have never thought of mixing omelettes with Banana's. I think this takes top marks for most unique dish! And I love your 'two ways'. Thanks for this entry! I love the savory banana. I am serious about this. Beautiful... it looks soooo delicious. I would never have thought to make this. I cannot wait to try. Some cooked pearl barley is in my fridge waiting patiently for its time to shine -- maybe I'll warm that in some almond milk and use it in place of rice...? Thanks, and thanks for your efforts in this event! when you are in NY, try Saravana Bhavan Dosa Hut on 27th and Lexington. They sometimes (but not always) have a banana curry. It is really something wonderful. I'm sure pearl barley would be fine, but there is really an extraordinary synergy between the rice and bananas.